It’s the final week of the academic year at Augsburg College, with many celebrations marking the accomplishments of the year — culminating in the commencement ceremonies on Saturday, April 29, one-year anniversary of the groundbreaking ceremony for the Hagfors Center. Street closure begins next week. A reminder that 21st Avenue South will be closed between South 6th and South 8th streets beginning next week and lasting throughout the summer. McGough Construction has received the permit from the City of Minneapolis for this closure, which is required in order to complete work on the skyway and the intersection of 21st Avenue South and South 7th Street. 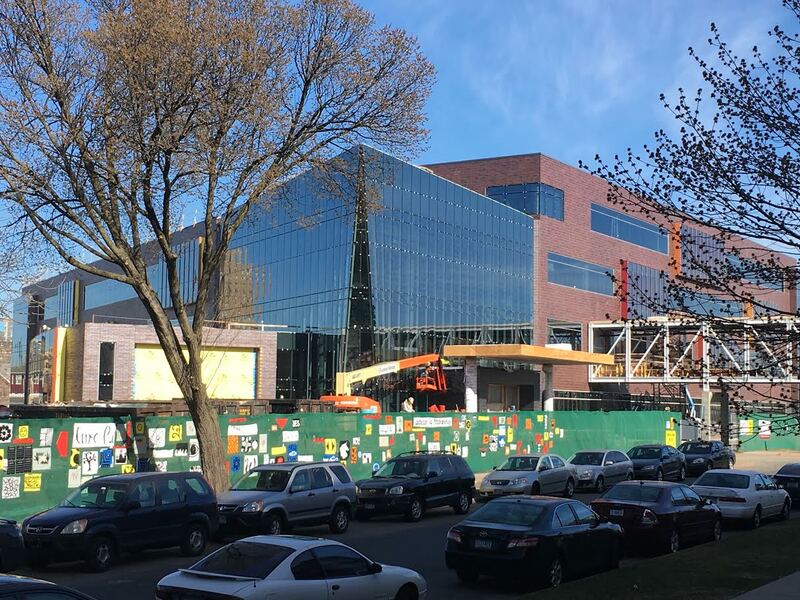 Pedestrians will continue to be able to cross 21st Avenue South to access Anderson and Luther residence halls to the south of the construction site; and vehicles will continue to have access to South 8th Street and the parking lots south of it. Vehicles and pedestrians will also continue to be able to use the north end of 21st Avenue South to access Riverside Avenue, South 6th Street, the driveway adjacent to Oren Gateway Center, and the private home south of Oren. See below for additional updates on this week’s construction work. 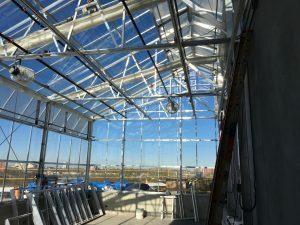 Fans and sunscreen shades have been installed in the rooftop greenhouse, which features some of the best views from the Hagfors Center! Green house. 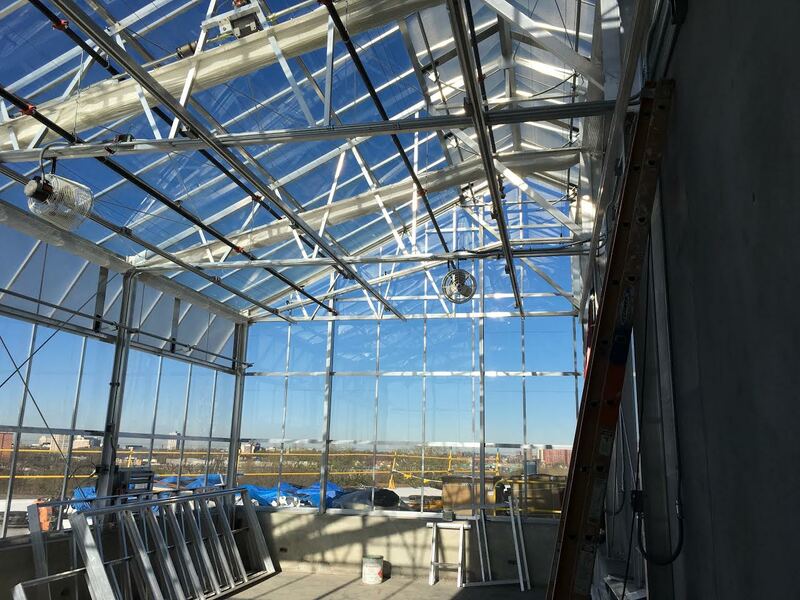 The fans and sunscreen shades have been installed in the rooftop greenhouse (see photo, at left). 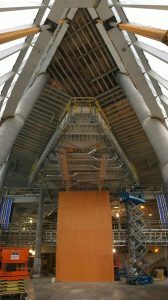 The remaining work in this area — installation of lights, tables, and the epoxy floor — will be completed during the summer. Piles of insulation rest on the top of the skyway, awaiting installation. Skyway. 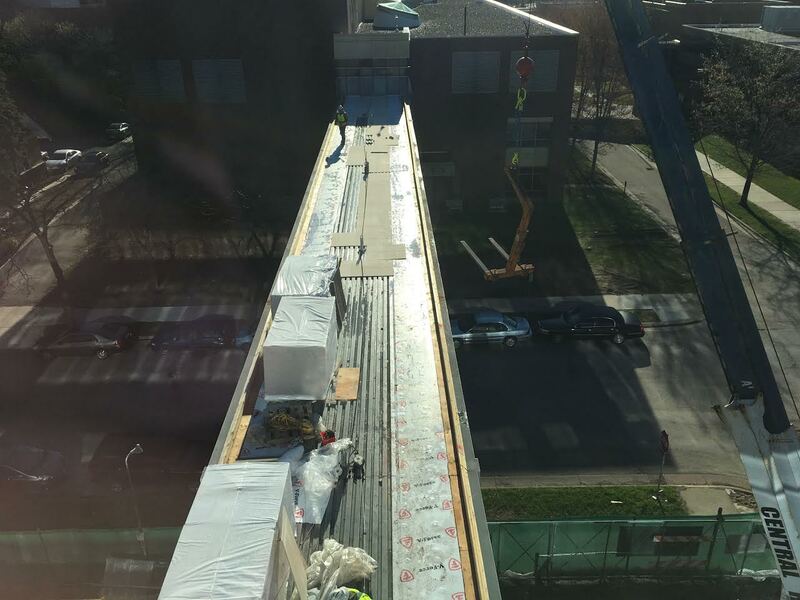 Crews will begin installing insulation and the final roofing for the skyway this week. 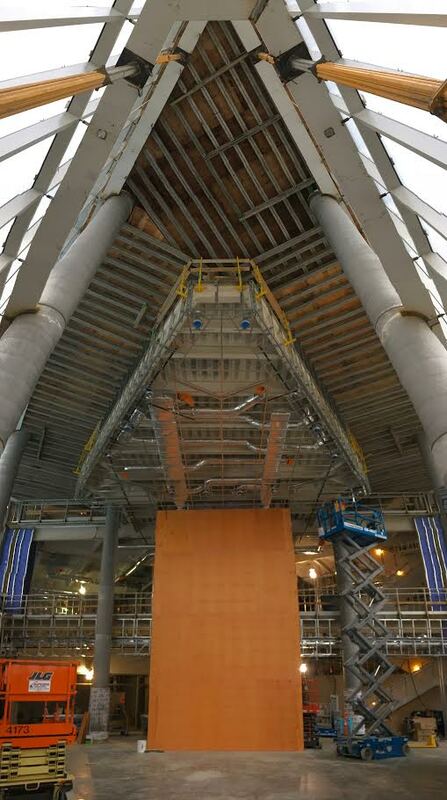 The photo at left shows insulation materials stacked on top of the skyway, ready for installation. A view of the front entrance from inside the lobby. Front entrance. The hand laid brick has been completed on the front entrance. See photo at left for a view of the entrance from inside the building. 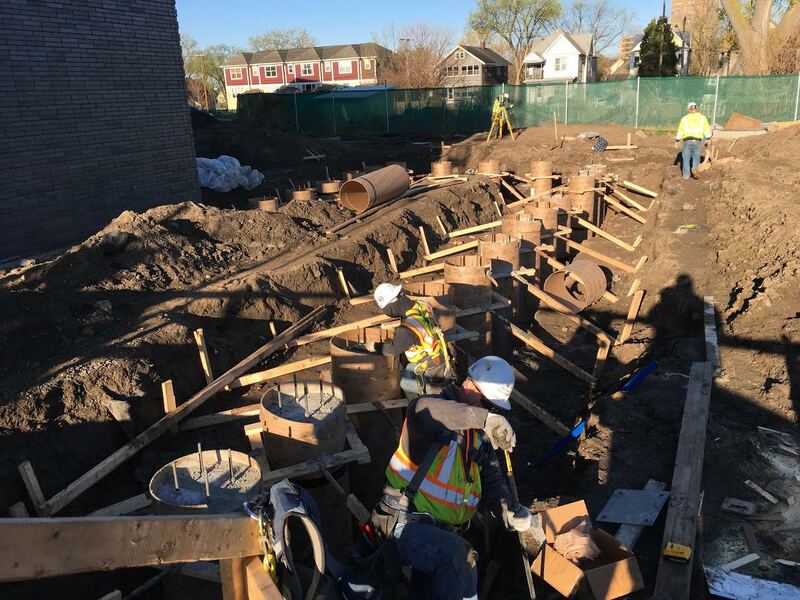 Crews prepare the pier footings in the electrical yard. Electrical yard. 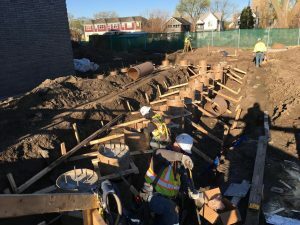 Excavation and installation of the pier footings is underway in the electrical yard, on the north side of the building (see photo, at left). The electrical yard is where the main Xcel Energy power feed comes into the building and where the emergency generator will be located. 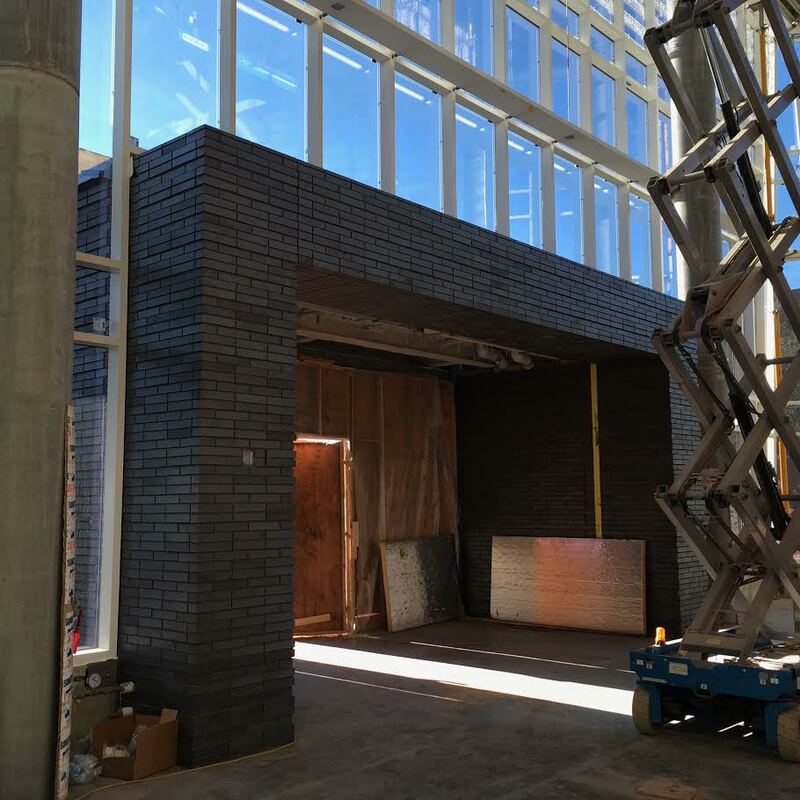 The framing and backing for the two-story elm wall is in place in the lobby. Lobby interior. The backer panel has been installed for the two-story elm wall that will be featured in the lobby. See photo at left to get a sense for how the lobby will feel when the elm wall is installed.